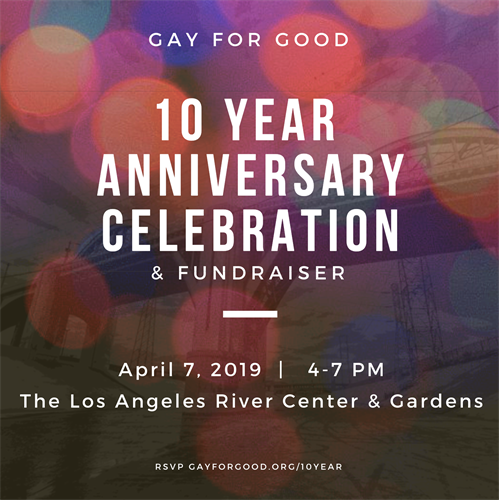 On Sunday, April 7, 2019 Gay For Good will gather in Los Angeles to honor our founders, thank our volunteers, and celebrate Gay For Good’s milestone 10th year. We invite you to join us at the beautiful and historic Los Angeles River Center & Gardens for a fun filled celebration to support Gay For Good. All Gay For Good leaders, volunteers, community partners, supporters, family and friends are welcome. Tickets are $50 each and proceeds from this event support Gay For Good’s ongoing volunteer programs, currently in 15 communities, and help to recruit new LGBTQ, and ally, volunteers, train new leaders and scale our volunteer program to new cities. Proceeds from this event support Gay For Good’s ongoing volunteer programs, in Long Beach and our 15 other chapter communities, and help to recruit new LGBTQ, and ally, volunteers, train new leaders and scale our volunteer program to new cities.